"general information site on CIL"
Thank you for visiting our Web Site, there are many pages for you to browse, but first I would like to tell you a little about this very important Independent Lifeboat Organisation. The only operational lifeboat based at Cowes came into service under the direct control of H.M. Coastguard at Lee-On-Solent at Easter 1989 with just a hand full of crew as a full member of the Solent Sea-Rescue Organisation. 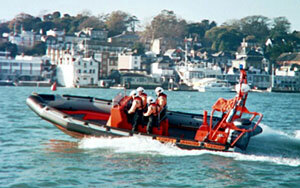 1st January 2002 saw the introduction of our third generation of lifeboat to enter service at Cowes. It is a locally built and fitted out 8.9m Barbarian Class RIB powered by twin 225 hp Yamaha four-stroke outboard motors, costing in the region of �0,000. The boat called "Spirit of Cowes" is equipped with state of the art navigational aids and other specialist kit and carries a crew of 4. The other two boats to serve this Independent Unit were an Avon 6m RIB powered by twin 75 hp Yamaha outboards ( 1989 - 1995 ) and a Tornado 7.4m RIB powered by twin 115 hp Yamaha outboards ( 1995 - 2001 ). The name "Spirit of Cowes" was introduced on the Tornado, which was officially named by The Princess Royal in July 1995. We provide this Independent Lifeboat Service all year round, 24 hours a day at an operating cost in the region of �,000 per year, financed by way of a small operational grant which the Isle of Wight Council contribute towards and by way of our own fundraising activities, any surpluses are carefully managed for future capital expenditure projects. We do not receive any financial help from other lifesaving organisations. In addition to providing this vital emergency callout service the boat is on patrol most weekends for the safety of the Solent mariners and for continuous crew training. During Cowes Week and other major events at Cowes we provide continuous patrols and safety cover under the direct control of H.M. Coastguard. I am very proud to represent this Organisation as I know from first hand experience for many years how dedicated you have to be to be part of the crew. At the time of finishing this letter, 2300 hours, our new lifeboat is involved in its first incident searching for a person lost at sea. The all volunteer male and female crew are on call 365 days per year, 24 hours a day via a pager callout system. Pagers are carried by the 25 plus crew members who respond to the emergency callouts averaging between 35 - 40 per year, assisting between 100 -130 people. There are many ways you may be able to help us maintain this service for many years to come from applying to be considered as crew, local or national fundraising, a personal donation or by setting up Deed of Covenant or Gift Aid. If you require further information about our Service or would like to offer your assistance in any way we would be very pleased to receive your enquiries, there is a Contact Page that give you addresses and telephone numbers. Follow the progress of our lifeboat workshop and production lines from live web cams which are updated every day during the staff lunch break. Whether your boating involves fishing, pleasure, charter or marina operations in the Isle of Wight, Bucky's understand your investment and the value of your time. The insurance you choose could affect the speed and quality of your return following a loss. Bucky's protect your interests in Cowes by providing the right insurance, expert advice and the fastest claims service possible. What ever you sail, motor in or paddle around Cowes, we have Bucky's to thank for keeping our pride and joys save in and out of the water. The Cowes lifeboat station is normally open to visitors in the summer months to see the lifeboat and learn about the crew. XHTML | CSS | Design by SWW"